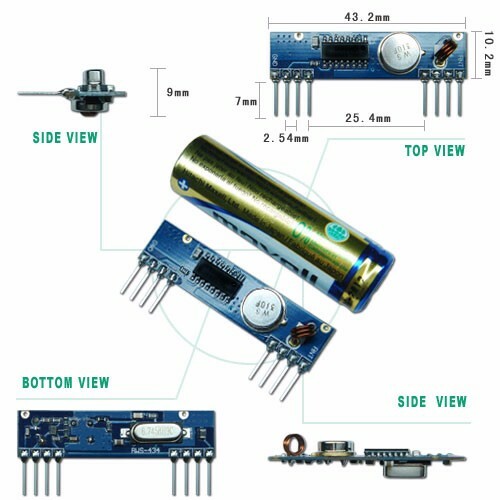 This 433.92MHz ASK RF Superheterodyne Receiver Module RWS-434N is through WENSHING R&D team assembled many years of experience to develop this high sensitivity OOK receive module. Lost cost, high stable also can provide the best RF solution in the market. Design ideal is to use SAW filter, highly suitable for industry control or bad place for use, strong anti-jamming. Built-in automatic gain circuit (AGC), it will automatically change front-end LNA gain among received signal strength also makes signal output will not be strong or weak signals which caused by phase distortion, so that it can rise higher sensitivity. To receive the local oscillation circuit for the PLL lock loop design, no offset, and stability is high. Frequency is 433.92MHz and receiver structure is Superheterodyne, received signal is OOK. After received signal, it will output TTL signal to external decoder IC for decoding. It is convenience to applicant in different products and external components is not necessary to make products be wireless also bring value-added for your products.